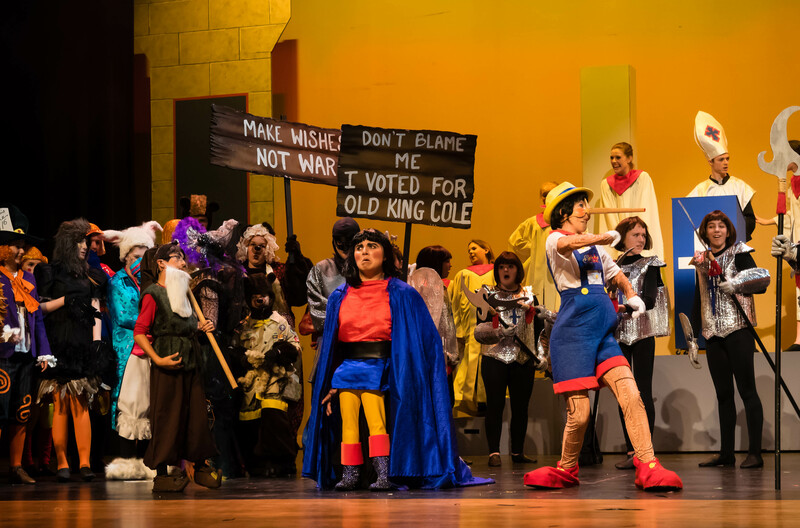 Some may recall the Sesame Street song of Kermit the frog, “It’s Not Easy Being Green,” and the recent Class Act Production of Disney’s musical, SHREK, is a case in point. It tells the sweet tale of a lime-green ogre by that name. 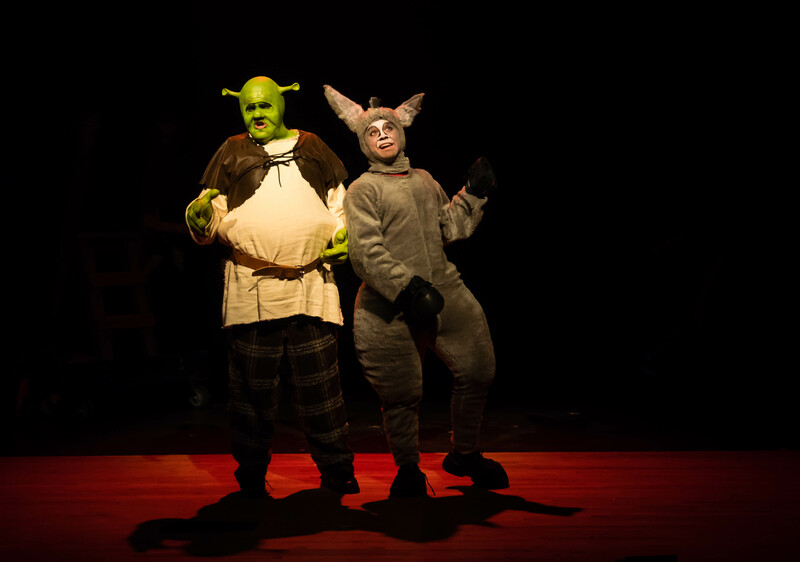 Shrek (Jack Wheeler) is content to live a lonely and isolated life in a swamp until a local nobleman, Lord Farquaad (Brad Brickhouse), begins exiling assorted children’s storybook characters to Shrek’s hitherto private domain. Shrek sets out to put a stop to this invasion by visiting Farquaad himself. 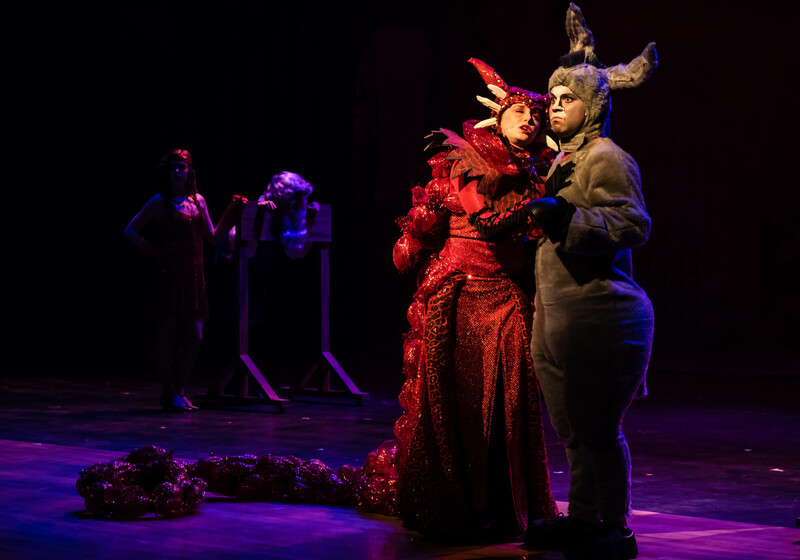 Joining him on this journey is the sassy Donkey, a character that, in the comical hands of actor, Aidan Stock, is nothing short of hilarious. The hilarity reaches still higher levels when the two reach the castle and we finally meet the uproarious Farquaad, played with comic mastery by Mr. Brickhouse. His costume alone was an absolute riot. It allowed the tall young actor to perform his entire role on his knees while appearing to be a pompous midget and total fop. The midgetizing effect of the costume called to mind the comical “Triplets” number featuring Fred Astaire, Jack Buchanan and Nanette Fabray in MGM’s classic film musical, The Bandwagon. Meanwhile Mr. Wheeler was clearly the right choice for the title role. In addition to singing so well, he brought countless sweet dimensions and wonderful sensitivity to the character of Shrek, and by show’s end we all feel a special fondness for this odd creature that could have been perceived as merely grotesque. Farquaad agrees to resolve Shrek’s dilemma if he and Donkey will first go on yet another quest to locate the lovely Princess Fiona and bring her back to the castle so Farquaad can marry her and thereby become king. 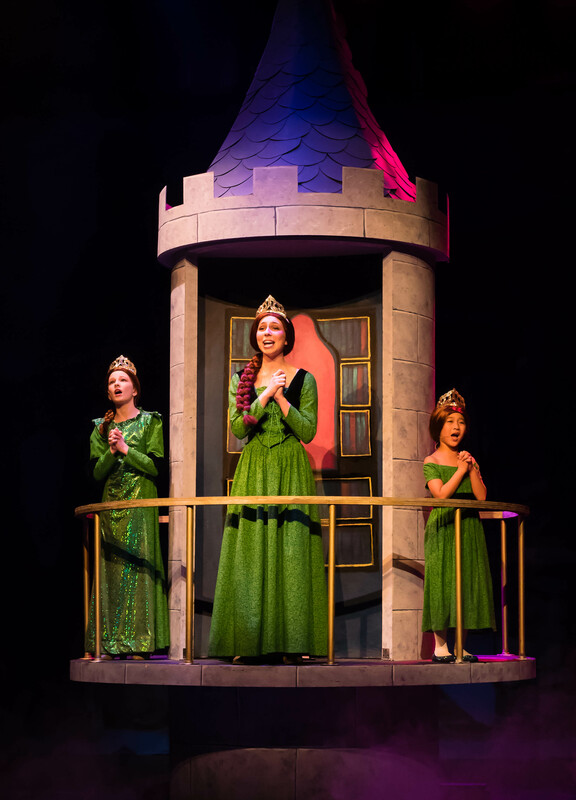 Fiona has waited for years to be rescued from a tower prison by her “one true love.” A clever theatrical trick allows us to see her long wait as a girl (Stephanie Ma), as a teen (Lena Torluemke), and finally as our lovely grown Princess Fiona (Sarah Rentcome). Always anticipating an imminent rescue, the three perform a lovely counterpoint trio of “I Know It’s Today.” Miss Rentcome’s fine voice adds joy to “This is How a Dream Comes True,” “Morning Person,” the cute, “I Think I Got You Beat,” (with Wheeler), and the charming, “Who I’d Be,” (with both Wheeler and Stock). Needless to say, in this delightful fairy tale world everything turns out well, and in the process we all relearn the lesson that beauty is only skin deep. Of course as is so often the case with Class Act Productions, the show began with the solid musical accompaniment from Music Director, Rae Moses and his 9-piece orchestra with the opening Overture. The company’s Producer/Artistic Director/Founder, Keith Brumfield was busy covering last minute details on a day when numerous events at the McCullough Junior High School had packed all the parking lots in the area of the Nancy Bock Center for the Performing Arts. As usual, Brumfield was fully prepared to pull off another miracle, especially with the help of the show’s fine Director, Tina Kraft Riddle, Set Designer, Kent Hale, Costume Designer, Laurie Lewis, Make Up Designer, Kirsten Berger and Choreographer, Jody Schrier. Along with a huge production staff and countless C.A. volunteers, only such a team could dare to undertake the management of the some 200 youngsters that make up the enormous and talented cast. It seemed as though every nursery rhyme and fairy tale character was adorably represented in this fun-filled adventure. Vocally talented Jenny Gee nicely overcame a microphone failure in her role as the Dragon. Delightful songs abound, and in featured roles the fine voices of Wheeler, Rentcome, Stock, and Brickhouse do justice to each tune along with marvelous support from the singing/dancing Ensemble that enriches numerous joyful and uplifting numbers. (Dig those dancing Rat Tappers!) The bad news is this show ran for last weekend alone. The good news is this 17th season of Class Act Productions will end with a summer production of “South Pacific” that will run for two weekends, July 11th –13th and July 18th –20th. Mark your calendars! 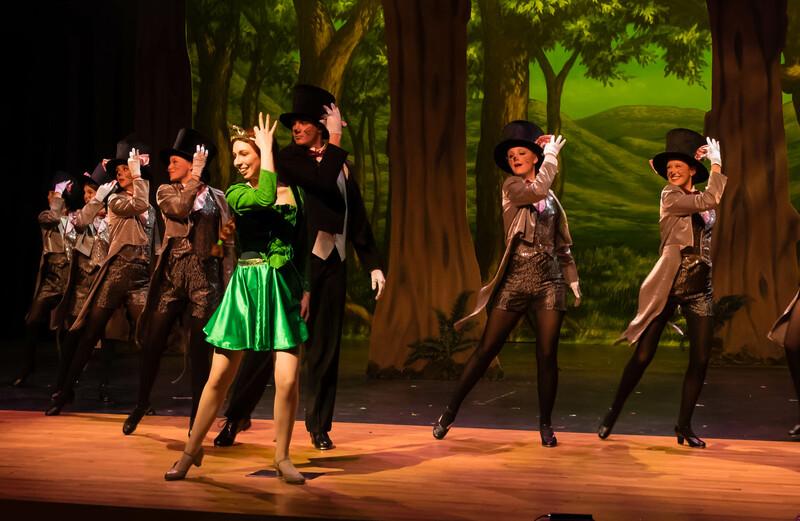 This entry was posted in Broadway, BroadwayStars.com, Class Act Productions, Conroe Courier, Disney, HERE HOUSTON-Lifestyle & Entertainment, HereHouston.com, Houston Community Newspapers online, Shrek, The Courier Columns, Theater Reviews, ThePeoplesCritic.com, YourHoustonNews.com and tagged Broadway, Class Act Productions, Disney, musicals, Shrek. Bookmark the permalink.